A weekly drop-in support group for parents to meet up. 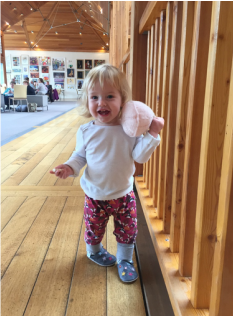 Grab yourself a tea or coffee from the Aspretto Café and come on upstairs to our comfy corner to chat to other mums and dads, speak to breastfeeding and babywearing peer supporters (when available), antenatal teachers and experienced parents, and relax in a friendly and welcoming setting. Dads, big siblings, aunties, uncles, grandparents and friends welcome too! We will be inviting the Sling Library and Cloth Nappy Library to these sessions. This session meets weekly except for Bank Holidays. 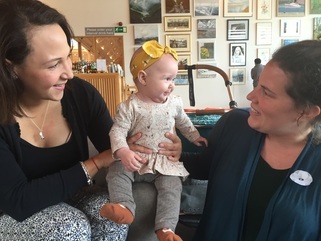 A friendly drop-in session for breastfeeding parents to meet, chat and let their babies play. Trained breastfeeding supporters will be on hand to answer any questions or concerns, including some expert guidance from a local lactation consultant. www.elymilks.co.uk) and in Bury St Edmunds. Private consultations for breastfeeding support and tongue-tie assessment and division are available at The Self Centre. See www.sarahoakleylactation.co.uk (www.facebook.com/Sarah-Oakley-Lactation) for more information. Contact sarah@nursingnurture.co.uk, or telephone 07729 629190 to make an appointment. 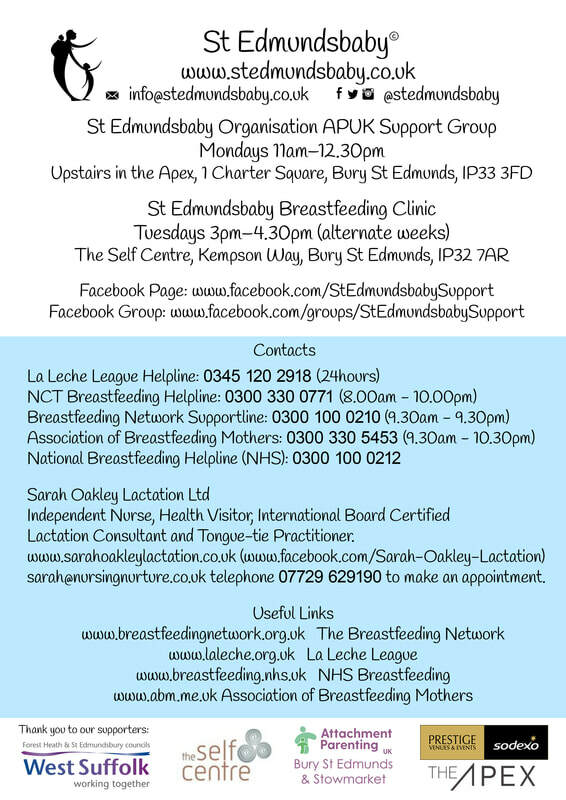 Sarah will very kindly be at the St Edmundsbaby Breastfeeding Support Group sessions on Tuesdays. 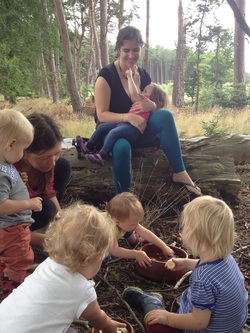 I went along to two different breastfeeding workshops when I was pregnant to try to prepare myself for what it would be like. Unfortunately, neither of these really left me with the knowledge I would have found useful, and I found the first couple of weeks really tough. 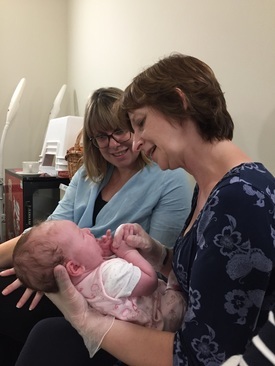 I was lucky, in that I had a very supportive husband, parents close by, and a couple of fantastic midwives, who got me through those first few weeks. Thanks to them, I fed Amelia for three and a half years, and I am so grateful I persevered. In hindsight though, I thoroughly regret not seeking out some support early on. There is a lot of conflicting advice flying around, and every woman is different, so our experiences are all different. My aim here is to try to discover what is available in this area, and to provide you with contact details for as many resources as possible to make your breastfeeding journey as smooth as possible. Of all the things I have learned along the way, the most important to share is to trust your own body and your instincts. Our breastmilk is an incredible and versatile thing, not just nutritionally, but for soothing through illness, or a bump, or just for comfort. There have been many days (and nights) where it felt like she would never be satisfied and had been latched on all day, and others where she was hardly interested. Try to relax about it and go with your instincts. The other thing I wish I had known, is that it is not easy for everyone. It can be hard work to get a good relationship going with your baby! It is a team effort after all! Through the rough times, the knowledge that I was benefitting my baby and myself in so many ways, and knowing we were not alone in our experiences made it much easier.